The challenge of the new. No writer wishes to repeat themselves. No writer wishes to simply rehash conflicts of old. Yet, without knowing truly what it is they are writing, many authors blindly follow the well-worn path of conflict. In this series on Conflict, we’ve seen common approaches and not-so common approaches towards dealing with this important aspect of storytelling. 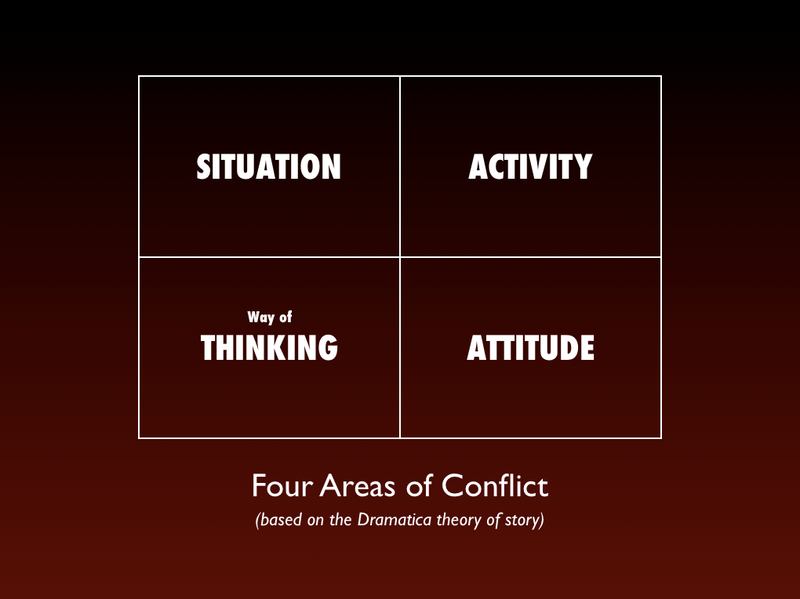 Using the Dramatica theory of story and its comprehensive look at the four areas of conflict, we’ve been able to figure out why certain films feel similar and why others seem to chart their own course. By assigning the four Throughlines of a story (Overall Story, Main Character, Influence Character and Relationship Story) to one of these problematic areas of conflict, a writer imbues a work of narrative fiction with a distinct tangible personality. In earlier articles the Overall Story Throughline, or main area of conflict, confined itself to either Problematic Activities or Problematic Ways of Thinking; in other words the characters as a whole beat themselves up physically or psychologically. While the majority of Western storytelling prefers this external or internal look at procedural conflict, stories do exist where the characters as a whole face conflicts of a static nature. Whether facing some Problematic Situation or Problematic Fixed Attitude, the characters in these stories find themselves faced with something stuck. Getting that thing or things unstuck generally becomes the Goal of such a story. 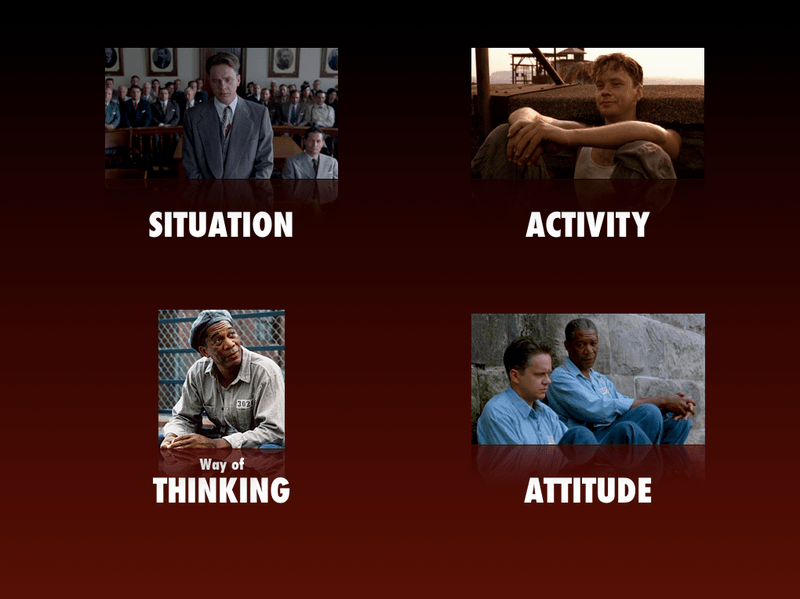 In The Shawshank Redemption one would assume that Red (Morgan Freeman) is the one stuck, and by accepting the call to “Get busy livin’” he becomes unstuck. A closer look at the structural conflicts proves this incorrect. In the hallowed halls of this sad prison, lifer Red comes to meet and befriend fresh fish Andy Dufresne (Tim Robbins). This relationship—the heart of the story—focuses on the nature of hope and if it is “a dangerous thing.” Their conflicting attitudes about this issue puts the Relationship Throughline of this story in the Fixed Attitude section. Instantly one can sense the difference between this film and the films analyzed before. Instead of convincing one another, manipulating the other into thinking the way he or she does, the relationship now centers on two incompatible views. I think this, You think that and one of them has to change. Definitely a different feel to this kind of Relationship Throughline. Utilizing the reasoning elaborated on within the article Naturally Structuring a Story for Conflict, this would put the Overall Story Throughline firmly in a Problematic Situation. What is the problem that brings everyone in the story together? An innocent man has been unjustly accused. “I’m innocent,” Andy says. Yeah, right, and so is everyone else. They’re all stuck, and again, instead of fighting it out within the scope of activities or collectively backstabbing each other in a game of manipulations, here Stephen King explores the ups and downs of facing a problematic fixed situation. Note the difference between this structural set-up and that of Star Wars, The Matrix or Finding Nemo. 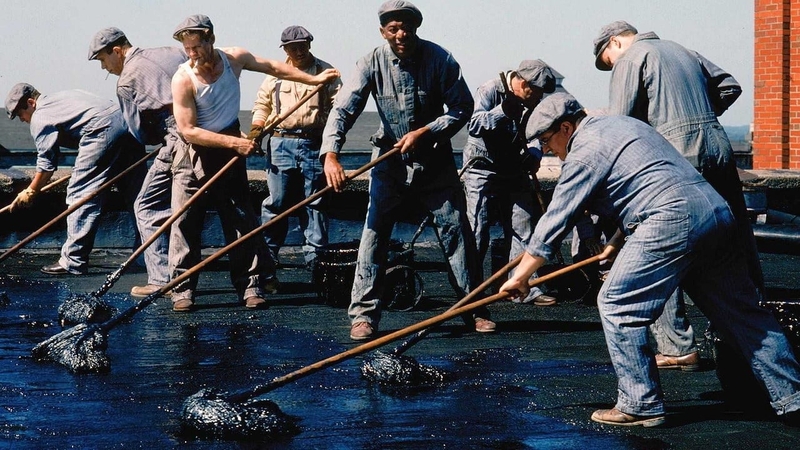 Instead of confining the static nature of conflicts surrounding Attitudes and Situations to one or two characters, a story like The Shawshank Redemption incorporates everyone into the struggle against fixation. It takes an objective view of this static area of conflict. This leaves the more process-oriented conflicts of Activities and Ways of Thinking to the subjective throughlines of Main Character and Influence Character. Red and Andy. Who suffers from a Problematic Way of Thinking and who struggles with Problematic Activities? Think back to Red’s meetings with the parole board. What issue does he run across? To say what you think they want you to say, to think you have to kiss up and support those who hold power of you, showcases the thinking of an institutionalized man. Red says he is a changed man because he doesn’t want to rock the boat, he’s saying what he thinks he needs to say. That’s a character struggling with a Problematic Way of Thinking. This puts Andy in the Problematic Activities area and again, yet another example of how the structural chart naturally lays out the focal points of conflict within story. Whether it’s hiding from the “Sisters”, dangling on the precipice of a freshly tarred roof or digging his way through miles of … stuff … Andy’s conflict is all about what he does and can’t do. How exciting and exotic is it to consider writing a story where the central character struggles with the way they go about thinking things? It is not like Kung Fu Panda or How to Train Your Dragon or Welcome to the Dollhouse where the Main Character has to overcome their physicality. And it’s not like Finding Nemo or Unforgiven where that personal take on conflict focuses on a mindset that needs changing. Here you have a Main Character struggling with a dysfunctional psychology. How tantalizing! This is perhaps the reason why so many are quick to relegate Red to a “point-of-view” character or a “second protagonist”. Understanding the personal conflict of someone dealing with a Situation or an Attitude? That’s easy, or more recognizable for most, because of the familiarity both in the sheer numbers of stories that take this approach and because of life itself. Who hasn’t felt ostracized for how they look (Situation)? And who hasn’t discovered they were truly wrong about something (Fixed Attitude)? But questioning the way one goes about thinking of something? It’s a concept so foreign that most writers wouldn’t even bother considering it. But Stephen King did. And for his efforts, we received The Shawshank Redemption. Shakespeare as well thought it an intriguing area of conflict to explore when he wrote Hamlet. And what a priceless treasure that play has been over the years. To be or not to be? No struggle here with physicality or errant opinion. Clearly, the Prince of Denmark struggles with his own conception of himself and how best to carry out his plan—a struggle with the internal process. The Dramatica structural chart affords writers the chance to write something truly unique, something truly off the beaten path. The problem is that those who produce stories generally aren’t comfortable with the new. When you consider the recent slate of films—geared more towards selling toys and building upon deep-rooted properties—the notion of diving into the intricacies of how a character thinks and the struggle to overcome deficiencies comes off unappealing, unattractive and an easy one to pass on. But with the rise and ease of distribution of self-publishing, the chance for writers to explore this uncharted territory becomes unavoidable, a siren song among the common. Sure, one can easily write great stories of Main Characters plagued with their station in life (The King’s Speech) or stuck with troubling assumptions (Up in the Air), but consider the challenge of writing something as wonderfully complex as The Shawshank Redemption or Hamlet. The opportunity is there. The difficulty lies in writing this kind of story so well that everyone clamors for it regardless of its potential at the box office. The exotic carries with it great risk, but also great reward for those willing to push themselves.